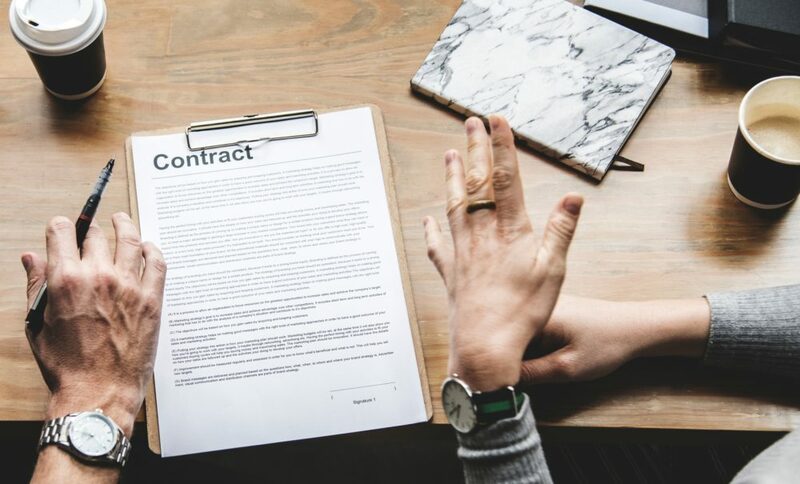 If you don’t have a freelance contract template (that you use EVERY time), it’s time for an intervention—and a ready-made contract (free download below) you can customize for yourself. Enter your email below and get immediate access to the actual freelance contract I use when I start working with new clients. As a template, it comes with notes and tips for making it yours. Why am I sharing my contract? Well, I’ve been in business for sixteen years—and so many people have helped me along the way. So if I can help you get stronger as a freelancer FASTER, then I’m in! It’s why I blog here, and it’s why I’m sharing my freelance contract as a template. I use my contract to accompany my Estimate which specifically defines scope of project, timeline, revisions and specific fees and fee schedule. A freelance contract is about setting expectations, eliminating confusion, and protecting both sides. It’s the responsible thing to do—and it lets your client know they’re working with a professional. So, plainly put…be professional. Use a contract. It will make everyone feel better! The biggest mistake is not having one! I want every freelancer to have a contract for even the smallest project—no ifs, ands or buts about it! Beyond that, make sure to avoid these missteps. Not including a timeline. When are they getting what? And when are they paying for what? Define this either in your contract or in an accompanying Estimate or Proposal. Giving too much time to pay. What’s your effective date? This contract should not be valid forever. I use a term of 90 days. The client has to execute the agreement within that period or it’s subject to change. Using complicated jargon. Even though it’s legally binding, a successful freelance contract doesn’t need to be ultra-complex. It can be written in plain English. Keep it simple, but thorough. Worried a contract is too overwhelming? Don’t worry. Cover what’s necessary. My contract is three pages long, and it’s never deterred a client. Make it easy to sign. You need people to sign before you begin a project. No exceptions! Just make it part of your process. Make it super-easy by letting them sign online. I use HelloSign.com which is only $13/month. The best thing about having a detailed contract is that you can include what specifically matters to you. Your job is to lay out the terms and conditions of working together. So everybody’s on the same page, I specifically define these important terms that are used throughout the contract: agreement, copyrights, deliverables, designer tools, final art, project, services and trademarks. 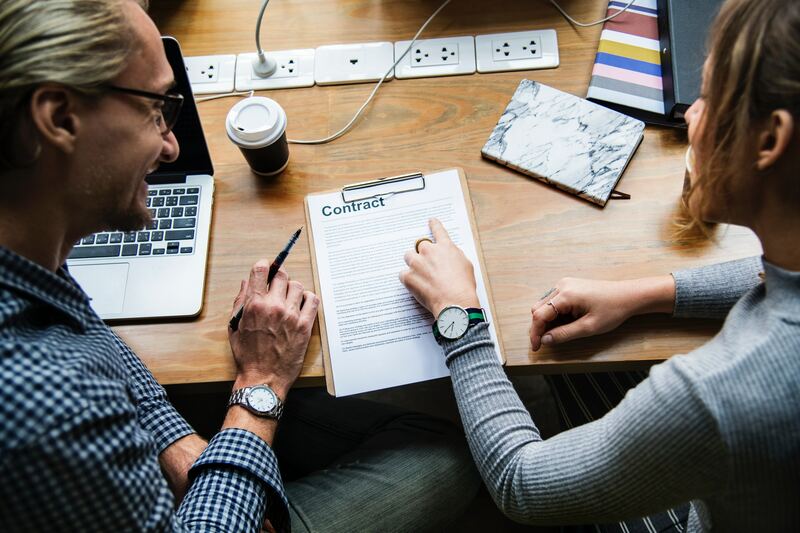 As this is a legal agreement, it’s important to define the term agreement and that you and the client agree to all statements included in the contract, Proposal, Estimate, etc. I like to send the project scope, fees, timeline, and number of revisions in a separate, formal Estimate, so this Agreement section states that the Estimate or Proposal is included. Define that the term copyrights means the right to original work you create in a tangible format that is enforceable under U.S. Copyright Law or the laws of your country. These rights are covered specifically in the Grant of Rights section. The term deliverables is used often throughout the contract to refer to the services specified in the Proposal or Estimate delivered by the freelancer to the client. Any tool that you use to perform your services should be included here. Since I am a web designer, I call this section Designer Tools and include software, source code, fonts, applications, comps, concepts, sketches, visual presentations, rejected designs, and layered files. Final Art is defined as all the creative content that you will deliver to the client such as website design, graphic design, illustration, photography, animation, sounds, typographic treatments, etc. Define that the term project means the scope of the work to be used by the client as described in the Proposal or Estimate. Services means the work you provide to the client as stated in the Proposal or Estimate. Define that the term trademarks includes trade names, words, symbols, designs, logos or items used in the Final Art and Deliverables provided to the client. You don’t want an Estimate or Proposal to be valid forever, so include a length of time in your freelance contract template your estimated fees will be applicable. If the client doesn’t execute the agreement within this time frame, you have the right to reestimate or change the project. This section covers the difference between fees and expenses, the payment timeframe and what happens if payments are late. Fees are what the client pays you for your services in the amounts and timeframe you specify in your Proposal or Estimate. Expenses are additional fees you incur above your agreed upon project fees. Expenses may include printing and production, photography, artwork licenses, online access fees, postage, shipping, presentation materials, and photocopies. If you plan to markup these fees, include that markup amount in this section. It’s also a good idea to state that no expenses will be assessed unless approved by the client first or included in the Proposal or Estimate. You don’t want to surprise a client at the end of the project with these costs. The Invoices section defines when invoices are due and any applicable services charges such as late fees. I state that all invoices are payable within 30 days, a 1.5% monthly service charge is payable on all overdue balances, payments will be credited to the late fees first before they are applied to the unpaid balance, and the client shall be responsible for any legal fees incurred by late payment. Whether you enforce late fees or not, it is a good practice to be clear on what is expected from the client should you need to charge a late fee. You should also reserve the right to withhold deliverables and rights if invoices are not paid in full. The main goal of the Grant of Rights section is to state who owns what (and when), and who gets to use what (and when). To be clear, I specify this for the following items: Client Content, Trademarks, Designer Tools, Assignment, Attribution, and Samples. Client Content, any materials supplied by the client so you can perform your work, remains the property of the client, and you have the right to use these materials to complete your services. The Trademarks section details what happens regarding trademark ownership after the project is completed. This section will vary depending on how you license your work. I assign all trademarks and copyrights to the client once I receive payment in full. I also agree that I will provide any documentation needed by the client to secure a trademark. The client is responsible for ensuring that any proposed trademarks do not infringe on anyone’s rights, and the client agrees not to hold me liable if any infringement should occur because the client didn’t obtain the appropriate rights. Designers Tools, as defined in the Definitions section, are to remain my property. I grant the client the right to use any of these tools in conjunction with the final deliverables, but the client may not create derivative works or modify these tools. However, the client may update any web code included in a website project. The Assignment section reiterates that, upon completion of services and full payment, I assign all rights to the Final Art and Deliverables to the client. The Attribution section allows me to say that I performed the work and that I can request the display or removal of attribution. The client has the right to remove attribution from a project at their request. As a web designer, this comes into play when I add a small line of text, Site created by Jill Lynn Design, at the bottom of a website. The Samples section states that I have the right to showcase my work in my portfolio, design publications, etc. I do have some clients that I provide white-label services for who have asked that I not show their projects in my portfolio and I respect their wishes. If requested, I could amend this section for a specific client if they want a formal statement that I will not publicly showcase work I create for them. What do you expect from your client during work together? Define expected involvement in this section. I specifically mention timely decision-making, provision of content, and proofreading. If any errors, such as misspellings, remain in the finished product, the client shall incur the cost of fixing these errors. and will not disclose this information to any third party. Confidential Information does not include any information that is in the public domain or becomes publicly known through no fault of your own. What is the relationship between you and your client? I use this section to explain the terms Independent Contractor, Designers Agents, and No Exclusivity. As an Independent Contractor, I am not an employee of the client. While I will take direction from the client, I shall determine the manner and means by which my services are accomplished. I state that my work shall not be considered work for hire as defined under U.S. Copyright Law. The section Designers Agents designates that I am permitted to engage third-party designers or service providers to complete my services. No Exclusivity states that there is no exclusivity in the relationship. You don’t want the client to think that you will only be working for them. I am entitled to offer and promote my services to others and engage other clients. The client is also free to engage others to perform similar services. What does the future hold regarding this project and relationship? In this section of my freelance contract template, I define the parameters, time periods and details regarding support services and maintenance. I define the Warranty Period as 90 days after a website is launched. This refers to technical support and assistance to maintain and update the site including correcting any errors and troubleshooting any found issues until they work. It does not include the development of enhancements to the Project or other services outside the scope of the Proposal. I agree that any web code produced will fulfill it’s intended purpose. I also state that all work is tested in the current versions of modern desktop and mobile browsers and that users of Microsoft Internet Explorer 11 and up get an appropriate experience. In the Maintenance section, I discuss my Maintenance Plan and the services I provide for a quarterly fee. The Maintenance Plan can be cancelled at any time. If something bad happens in the future and it’s somehow related to your project, who is responsible? This is the place to protect yourself from liability. In the Indemnification section, the client agrees to not hold me liable for any and all claims, costs, and expenses, including attorney’s fees, due to materials included in the work at the request of the Client for which no copyright permission or privacy release was requested. For example, if the client supplies a photograph that they did not have the rights to, and the photographer sues them, the client cannot take action against me for publishing this photograph on the client’s website. The Limitation of Liability section states that all my work is sold “as is” and that my maximum liability to the client for damages shall be limited to my net profit from the project. What if the project stalls? What if it gets cancelled? This section lays out the specific timeframes and expenses associated with each situation. In the event that the project stalls due to the client’s actions, including not providing content in a timely manner or not providing feedback on deliverables, I consider the project on-hold. Once a project is on-hold for over 60 days, I can terminate the project. If the client wants to resume the project, they will be responsible for a restart fee of $500 or 5% of the total project cost, whichever is greater. If the client terminates the project, I shall be compensated for the services performed through the date of termination in the amount of (a) any advance payment, (b) a prorated portion of the fees due, or (c) hourly fees for work performed, whichever is greater. The client shall pay all expenses. The initial deposit/advance payment is non-refundable. I cannot stress enough the importance of having a non-refundable deposit should something go South with a project. I also state that these Terms & Conditions shall apply to all future projects I perform for the client in accordance with a Proposal or Estimate accepted by the Client. This section clarifies the contract’s legality with the most important part being: “Its terms can be modified only by an instrument in writing signed by both parties, except that the Client may authorize expenses or revisions orally.” All disputes shall be submitted to binding arbitration in accordance with the rules of the American Arbitration Association. This is also important to include so the client cannot take you to small claims court. They must go forward with any dispute via arbitration. You’ll also want to make sure to include the appropriate governing party. In my case, I state that this Agreement shall be governed by the laws of the State of Georgia. The signature makes it real, folks! Make sure they sign and both parties receive a copy for their records. To make sure you’ve covered all your bases, you might want to get your contract reviewed by a lawyer. Any information here is not intended as legal advice. Now, so I can sleep tonight, please answer YES (below in the comment section) to this question: Will today be the last day you operate without a contract?